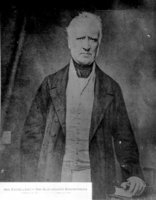 KELLY, MICHAEL JOHN, politician and officeholder; baptized 20 May 1815 at St John’s, Nfld, son of Gilbert Kelly and Margaret Knee; m. 1 Dec. 1842 Bridget Doohan (Droohan), and they had at least one daughter; d. 25 March 1890 at Brigus, Nfld. Michael John Kelly first comes to notice on 22 May 1855 when he was elected to the Newfoundland House of Assembly as one of the representatives from Placentia–St Mary’s. He was acting colonial secretary from 9 March to 9 May 1857, receiving £250, and that year was also honorary magistrate of the French shore from Cape Ray to Quirpon. On 15 May 1857 he replaced Patrick Hogan as the appointed representative for the district of Placentia to the Roman Catholic board of education. The same year Kelly and James Luke Prendergast became acting superintendents of the fisheries of Newfoundland, and after four months of preparation presented reports to the House of Assembly. Kelly was paid £200 for his report on measures for the protection of the fisheries and on the settlements in Labrador and along the Strait of Belle Isle. The Act for the Encouragement of Education, passed on 10 May 1858, empowered Sir Alexander Bannerman*, as governor, to appoint two competent school inspectors, one Protestant and one Roman Catholic. On 25 May Kelly was named the first Roman Catholic inspector of schools for the colony at an annual salary of £200 plus expenses and John Haddon became the Protestant inspector. Kelly resigned his seat in the assembly immediately upon accepting the post, but was sworn in once more for Placentia–St Mary’s on 27 Jan. 1859. The duties of the two inspectors included visiting all the grammar and commercial schools in the colony, submitting annual or semi-annual reports to the legislature on such matters as number of scholars in attendance, subjects taught, kinds of texts used, state and size of school houses, amount of government allowance and tuition fees received by each teacher and their qualifications, as well as the general effectiveness of the system. The school boards, appointed by the governor according to the act, were required to return statements on the amount of funding received under the act to the inspectors for inclusion in their reports. In 1860 reports were received from 90 Roman Catholic schools with 4,639 registered pupils (there was an average daily attendance of 3,195); in 1864 the total number of schools in Newfoundland was 292 with 15,798 students. The reports of the first inspectors, Kelly and Haddon, were frank and, because they described the level of teaching as perfunctory and poor, at times they received chilly receptions from the chairmen of school boards, teachers, and parents. Certain problems reappear frequently in Kelly’s reports: some of the schools were “unprovided with sufficient school furniture” and lacked “sufficient books,” others were “perfectly inoperative for portions of the winter.” Reasons cited for the poor quality were the subdivision of education grants and the “apathetic indifference exhibited . . . by the people to everything connected with education.” Kelly suggested that prizes be given at annual school examinations to students who attended regularly or who demonstrated progress in their studies, and that libraries be established in the principal schools. Kelly retired early in 1879, and he submitted his last report in March. His final salary stood at £1,333 annually and he drew a pension of £650 from the government of Newfoundland. Maurice Fenelon was appointed his successor on 20 May 1879. PANL, GN 2/1, 1857–59; GN 2/2, 1857–59. Nfld., Blue book, 1857–59; House of Assembly, Journal, 1855–75, esp. 1858, app., “Protection of the fisheries, taking the census, &c., at the Labrador and Straits of Belle Isle, during the summer of 1857,” 436–43. Harbour Grace Standard (Harbour Grace, Nfld. ), 2 April 1890. When was that? A chronological dictionary of important events in Newfoundland down to and including the year 1922 . . . , comp. H. M. Mosdell (St John’s, 1923), 69. Arthur Barnes, “The history of education in Newfoundland” (d. pæd. thesis, New York Univ., 1917), 99–109. Book of Nfld. (Smallwood), IV: 543. F. W. Rowe, The development of education in Newfoundland (Toronto, 1964), 140–41. Barbara J. Eddy, “KELLY, MICHAEL JOHN,” in Dictionary of Canadian Biography, vol. 11, University of Toronto/Université Laval, 2003–, accessed April 21, 2019, http://www.biographi.ca/en/bio/kelly_michael_john_11E.html.